A substitute folder is an essential resource that all teachers should have prepared and clearly labeled on their desk in case they are absent. This folder should provide the substitute with important information to help them teach your student's throughout the day. Class List: Provide a class list and place a star next to the students that can be trusted to help the substitute with any questions they may have. Teacher Schedule: Provide a schedule of any duties that the teacher may have (bus duty, hall duty). Attach a map of the school and mark the spots where they're assigned to go. Class Schedule/Routine: Include a copy of the daily routine. Provide information such as how attendance is taken and where it should go, how student work is collected, when students are able to use the restroom, how students are dismissed, etc. Classroom Discipline Plan: Provide your classroom behavior plan. Inform substitutes to follow your plan and leave you a detailed note if any student has misbehaved. 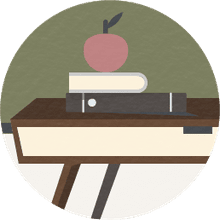 School Policies: Include a copy of the school behavior plan, what to do in case of an early dismissal, playground rules, lunchroom rules, tardy procedure, computer usage, and rules, etc. Seating Chart: Provide a copy of the class seating chart clearly labeled with each student's name and any important information about each child. Emergency Procedures/Fire Drills: Include a copy of the school's emergency procedures. Highlight escape routes and exit doors, so that the substitute will know exactly where to take the children in case of an emergency. Important Student Information: Provide a list of students' food allergies, medical information (such as medicine) and any other special needs. Time Fillers: Select a few five-minute activities in case the substitute has a few extra minutes to spare. Emergency Lesson Plans: Select at least a week's amount of emergency lessons in case you are not able to complete a lesson for them. Include spare worksheets and review sheets with enough copied for the whole class. Colleagues Contact Information: Include a list of names and numbers of the surrounding classroom teachers and faculty. Use a divider for each day of the week and place detailed lesson plans and procedure for that day. Use a divider for each essential item and place contents in the appropriate section. Use a divider and color coordinate each component and place contents in each section. Place important items in the front pocket such as office passes, hall passes, lunch tickets, attendance cards, etc. Create a "Sub Tub." Place all essential items in a color-coordinated filing tub and leave on your desk each night, just in case. If you know you will be absent then write the daily routine on the front board. This will give the students and the substitute something to refer to. Lock up personal belongings; you do not want the students or substitute having access to your personal information. Clearly, mark the folder and place it on your desk or in an obvious location.